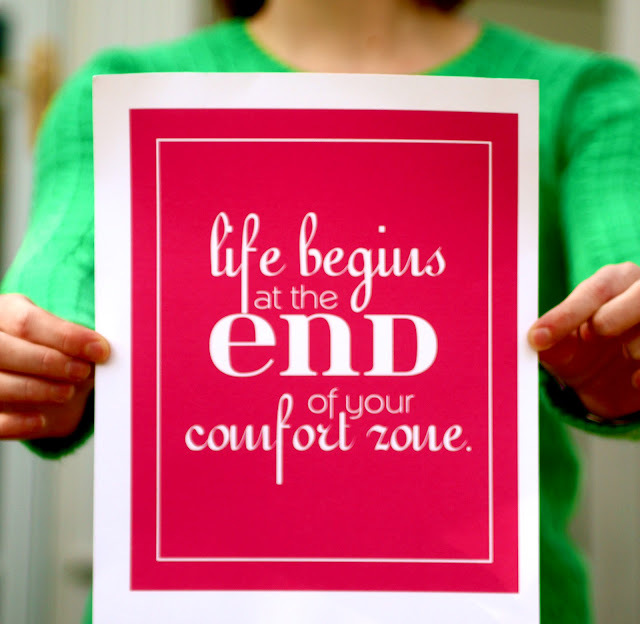 I love my comfort zone. I mean absolutely love staying within the confines of my comfort zone. I'm type A by nature, so I'm a list maker and planner. I plan, and plan, and plan. I even have a plan for the plan. I used to be a wallflower although no one believes me when I tell them that. I was so painfully shy as a child that I spent a lot of my younger years hiding behind my parents' legs. In fact, I was so painfully shy that I hated when my class sang "who stole the cookies from the cookie jar" in kindergarten because it meant getting called on. When I was about 13, I came out of my shell. I started becoming more outgoing and pushing myself every so slightly out of my comfort zone. And slowly but surely, baby step after baby step, I let go off my shy self and became the outgoing person that I am today. I love talking to strangers that I meet at target, the grocery store, on the running trails, etc. I thrive off of hearing others' stories and getting to know them better. And the girl who could barely sing the cookie jar song can't seem to shut up now. You would think that with an outgoing personality that I would love to attend conferences, meet new people, and get to spend so much time surrounded by strangers. But the truth is, large events are far from my comfort zone. They end up meaning many unexpected things, loads of people I've never met, and typically require a plane trip to get there; which is one of my greatest fears. While, I know this trip will be far from my comfort zone, it'll also be good for me. I'll get challenged, pushed in a good direction, and make some friends along the way. I'm somewhat nervous but ten times more excited for the experience. I know as far as it'll be out of my comfort zone, I know I'll look back at this experience as a good one. So here is to facing fears and flying and being open to new opportunities! Love this post! Visiting from Pleated Poppy! Cute shoes!! Have fun!!!! You will do great, see you in NYC!!!! You look cute! Love the pink and green together! Have fun! I can so relate to you and being shy. When I am in my comfort zone no one would believe I am shy but put in a situation where I am not and you wouldn't notice me in the room, I blend into the walls. Good luck and have fun this weekend and I love the green and pink combo so fun. have an awesome time, my friend! I'm stopping by via the blog hop. It's so nice to meet you :) I'm a new follower.